You've stumbled upon this...My Lair Of Darkness. My name is Maria, but prefer to be called Vampyre Night Angel or Duchess Of The Ghastly or Dharma or IxChel. I'm into dark poetry, and metal, hard rock, whatever you call it in your area. I like to go out with my friends. I like to drink. Bailey's on the rocks!!! Yeah, Bailey's rocks! *laughs* Or Dos Equis! :) I like to dance. I sing....yeah, not like for a band or anything. I'm currently working on putting all my poems into a binder, then possibly getting published later on. I love Vampyrs. The sexual lust, the power, everything. 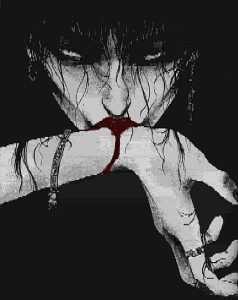 *smiles* I drink blood, human, yes I really do. *smiles* I only believe in that which I know is real. All that I can hold and percieve as real. I've learned to love again. Been hurt many times, no need to go into that now, the past is exactly that, the past. No use in going back to it. I spend most of my time doing my e-mail, poems, singing, and talking to different people. You're welcome to look through all my stuff...Enjoy.